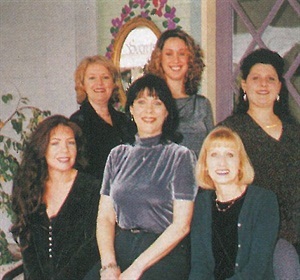 One year ago, Lynn Kogle and her staff at Secrets Salon in Long Beach, Calif., took on the challenge of revamping their business systems using the strategies taught in OPI’s business management program, The Edge - Standards & Systems for Success. We recently checked in on the progress at Secrets. Here’s what Kogle and Cheryl McCowan, Secrets’ spokesperson had to say about their successes, and their shortfalls. McCowan’s primary goal was to increase her clientele. Through client-building strategies like “Friendly Money,” a program that offers an existing client $5 off her service for every new client she sends to the salon, McCowan increased her clientele by 40%. Offering gift certificates and consistently sending service reminders and Thank You cards helped to promote better client retention as well. The Secrets staff also looks to community events to help them build their client base, participating in silent auctions supporting a variety of local charities. The salon donates gift certificates for salon services, and last year donated all of its unwanted nail polishes to a charity for the homeless. “Even though we are promoting our business, the real reward is the great feeling we get by giving back to our community through charity work,” said McCowan. An added business plus is the fact that all charitable contributions are tax-deductible. Tracking their tips is another area in which the group wishes they had been more consistent. According to McCowan, if she saved just half the money she earned in tips annually, her entire family could take a terrific vacation every summer. “It’s so easy to let that money slip through your hands on a daily basis,” adds Kogle. Why is it hard to develop new habits? McCowan’s theory is that if good business principles were taught in school, nail technicians would graduate with the proper skills and habits they need to be successful. “It’s always harder to retrain after learning something the wrong way. Business training is an important part of any medical training. It should be the same in our profession,” she says. To help get back on track both Kogle and McCowan agree that keeping their weekly business tracking form in their appointment book will provide a daily reminder to take a few moments to do the paperwork. After a year of putting the principles of The Edge training program into practice, the entire Secrets staff has learned how to incorporate retailing into their daily activities.